This trip starts at the Shell service station on the corner of Poinciana Ave & Moorindil St. Tewantin. Head along Moorindil St and cross the Noosa River on the Ferry (Fee payable). Follow Maximillian Rd and turn right on Beach Rd. Just past the Lake Cooroibah pub on the left is the car wash/underbody spray. At the end of Beach Rd there is a small area where you can air down. 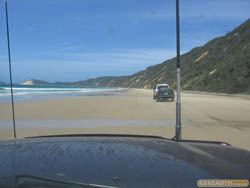 This beach entry can be soft at times, turn left on the beach and head towards Rainbow Beach. Be mindful of pedestrians and fishermen as they may not be able to hear you coming over the noise of the waves. Take care as you approach the washouts. Turn left onto Freshwater Trk and follow this all the way to Rainbow Beach Rd.Pump up your tyres and turn left to Gympie or Right to Rainbow Beach.